What she also hopes to do, of course, is win a second gold medal in her sport's fastest event, to go along with the one from the 2010 Vancouver Olympics. 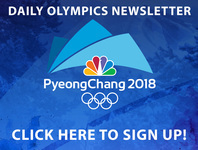 JEONGSEON, South Korea (AP) — Lindsey Vonn prefers not to dwell on what shapes up as a significant story line for the women's downhill at the Pyeongchang Games. "I've tried not to think about it as being my last Olympic downhill. Just focus on the moment, the right here and the right now. And I think later I'll reflect on how much I enjoyed it and how much my teammates and my coaches made it special for me," Vonn said ahead of Wednesday's contest. "But you can't get too sentimental right now, because I still have to race. I still have to be focused. And afterward, I'll do some reflecting." "Everything's great. I feel like a million bucks," she said with a smile. "And 33!" "Some of the lines I took (Tuesday) I think were faster, others not," Vonn said course-side, before going to analyze her run on video. "Everything feels pretty good." Vonn promised an "all or nothing" effort. "There's really no need to be nervous or think about pressure or expectation," she said. "If I'm nervous then I'm going to lose anyway, so what's the point?" She's also a snowboarder, though, and instead of entering the Alpine downhill, she will switch to her other sport and try to qualify Thursday in the parallel giant slalom. That would make Ledecka the first athlete to compete in ski racing and snowboarding at the Winter Games. Italy's Sofia Goggia, who edged Vonn in March to win the only World Cup downhill ever raced on this track, called Ledecka's double duty "one of the coolest things in the whole Olympics." The last women's super-G champ who skipped the downhill at the same Winter Games was Diann Roffe of the U.S. in 1994. She will now focus her energy on Thursday's combined, which adds the times of a downhill and one run of slalom, her specialist discipline. Four years ago, Slovenia's Tina Maze and Switzerland's Dominique Gisin tied for the downhill title with the same time down to the hundredth of a second. It was the first time in 78 years of Olympic Alpine skiing there were double gold medals. Maze and Gisin have since retired; Gisin's younger sister, Michelle, is in the lineup and was second fastest in the final practice run Tuesday. The bronze medalist last time, Lara Gut of Switzerland, is also a strong contender. Racers consider this a course that is neither particularly creative nor particularly steep, so the skiers need to generate pace on their own. "It's easy," Italy's Nadia Fanchini said. "Very beautiful, but very, very easy."